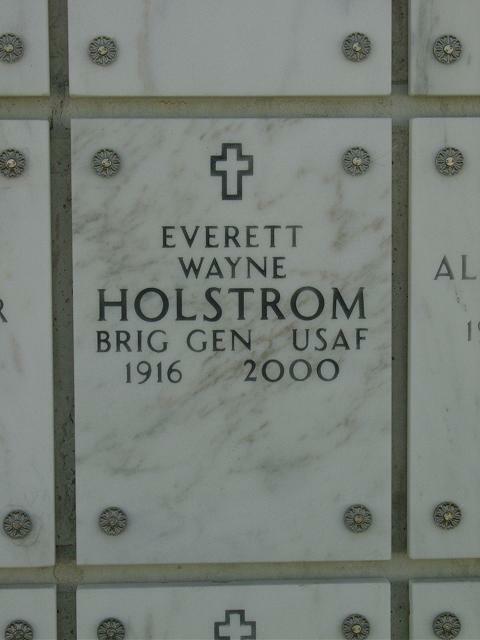 EVERETT WAYNE "BRICK" HOLSTROM, Brigadier General, United States Air Force, May 4, 1916-December 2, 2000. Cottage Grove, Oregon. He graduated from Pleasant Hill High School, Pleasant Hill, Oregon in 1934 and attended Oregon State College until he entered military service at Fort Lewis, Washington in December, 1939. Commissioned a Second Lieutenant and rated as a Pilot upon graduation from Kelly Field in 1940. He destroyed first enemy submarine sunk off West Coast of the U.S. on December 24, 1941 while a member of the 95th Bomb Squadron. He was then a member of the Doolitle Raiders, who struck the first blow against the Japanese homelands in World War II. He was the pilot of Crew Four. He remained in China-Burma-India Theater after the Tokyo Raid as 11th Bomb Squadron Commander until the end of 1943. Following World War II, was assigned to Strategic Air Command where he has held various operational assignments and is one of the few men who has commanded wings and flown all the multi-engine jet bombers in the SAC inventory-B-45, B-47, B-52 and B-58. He commanded SAC's first supersonic Bombardment Wing at Carswell Air Force Base, Texas. Decorations include the Silver Star, the Legion of Merit, the Distinguished Flying Cross with 1 Oak Leaf Cluster, the Air Medal with 4 Oak Leaf Clusters, Commendation Ribbon with 1 Oak Leaf Cluster and Chinese Army, Navy and Air Corps Medal, Class A, 1st Grade. He also holds aeronautical rating of command pilot and is entitled to wear the Air Force's Missile Badge. Retired October 1, 1969. 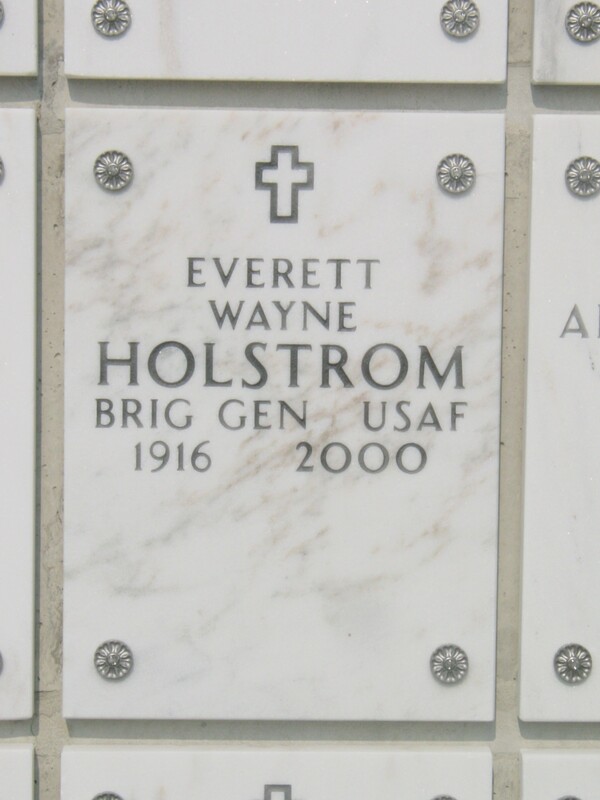 Everett W. (Brick) Holstrom was born at Cottage Grove, Oregon, in 1916. He graduated from Pleasant Hill High School, Pleasant Hill, Oregon, in 1934, and attended Oregon State College from that year and until he entered the military service at Fort Lewis, Washington, in December 1939. General Holstrom completed basic and advanced flying schools at Randolph and Kelly Air Force bases and was awarded the aeronautical rating of pilot upon graduation in 1940. Christmas Day in 1941 was an eventful one for Second Lieutenant Holstrom as well as the Army Air Corps for it was on this day that he had the opportunity of destroying the first enemy submarine off the west coast of the United States. The historic day of April 18, 1942, is also well remembered by the General for it was on that fateful day that he piloted a B-25 as a member of Jimmy Doolittle's raiders when the mainland of Japan was first bombed by U.S. aircraft. General Holstrom was forced to bail out in China, after dropping his payload on Tokyo. There, at Kunming, he assumed command of the 11th Bomb Squadron from early 1942 until the end of 1943. Following World War II, General Holstrom was assigned to Strategic Air Command Headquarters as an operations staff officer. From 1950 to 1953 he was a member of the 91st Bomb Wing as director of operations and also as deputy wing commander and moved with the wing from Barksdale Air Force Base, Louisiana, to Lockbourne Air Force Base, Ohio. From 1953 to 1955 the general was assigned to Second Air Force headquarters as director of operations. For the next two years he commanded the 301st Bomb Wing at Barksdale Air Force Base, Louisiana, and then returned to SAC headquarters from 1957 to 1959 as chief of the Operation Plans Division. On September 4, 1959, he assumed duties as commander of Second Air Force's 4130th Strategic Wing, Bergstrom Air Force Base, Texas. General Holstrom assumed command of the 43d Bomb Wing, SAC's first supersonic bombardment wing, in June 1961. He was promoted to Brigadier General March 1, 1964. The general's decorations include the Silver Star, Legion of Merit, two Distinguished Flying Crosses, five Air Medals, and two Commendation Medals. He holds the U.S. Air Force aeronautical rating of command pilot and is also entitled to wear the U.S. Air Force Missile Badge.